The romantic Spitzingsee south of the Schliersee is ringed by dark mountain forests. 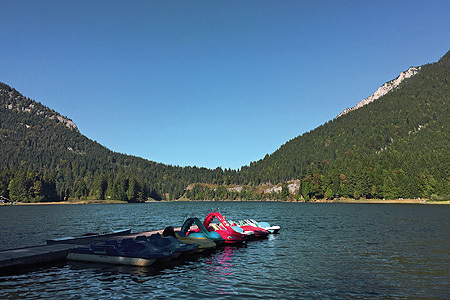 With an area of 28 hectares it is Bavaria's largest mountain lake. The quality of its water was greatly improved through the construction of a sewage disposal system, which was substantially supported by the state of Bavaria. In summer the Spitzingsee is the starting point for numerous walks and mountain hikes. In winter there is a total of 30 kilometres of ski slopes and 18 cable cars and lifts, making the Spitzingsee region one of the largest ski areas in Germany. The Spitzingsee is around 80 km southeast of Munich and can be reached on the Spitzingseestrasse, which branches off from the B307 between Schliersee and Bayerischzell.